water nearby. It still fascinates - and not just children. who happen upon it and wonder what caused it to be there. street flooding (the latter, I assume, to be tongue-in-cheek). But, the reason for the design has nothing to do with water. to become to visually impaired citizens of New Orleans. employment for people who were visually handicapped. was officially changed to the Lighthouse for the Blind. The building soon became a popular landmark. By the 1950's, a larger home for their programs and manufacturing facility was required. several businesses. 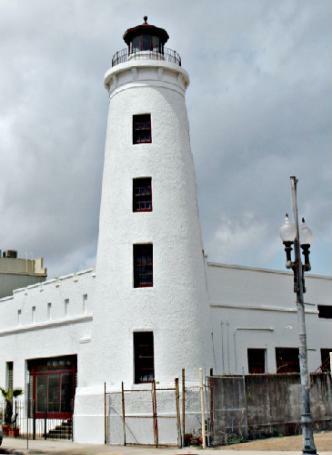 It's currently occupied by an art gallery, Lighthouse Glass. would be - a true beacon of hope for the visually impaired citizens of Southeast Louisiana.